Ever since Van Gogh arrived in Arles, he was constantly preoccupied with the representation of "night effects". 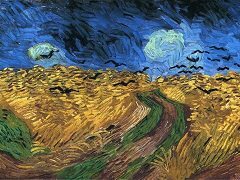 In April 1888, he wrote to his brother Theo: "I need a starry night with cypresses or maybe above a field of ripe wheat." In June, he confided to the painter Emile Bernard: "But when shall I ever paint the Starry Sky, this painting that keeps haunting me". 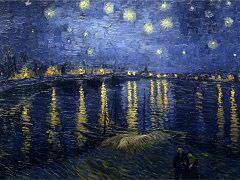 Starry Night Over the Rhone (September 1888) was one of three paintings made during the same month that incorporate the night sky and stars as fundamentally symbolic elements. He also painted Cafe Terrace at Night, and a portrait of his friend Eugene Boch which was perhaps the most symbolic of the three. Starry Night Over the Rhone was painted at a spot on the banks of river which was only a minute or two's walk from the The Yellow House on the Place Lamartine which Van Gogh was renting at the time. 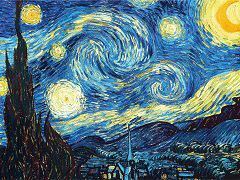 The night sky and the effects of light at night provided the subject for some of his more famous paintings, including the later canvas from Saint-Rémy, The Starry Night. 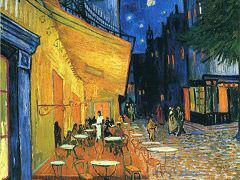 The challenge of painting at night intrigued Van Gogh. The vantage point he chose for "Starry Night Over the Rhone" allowed him to capture the reflections of the gas lighting in Arles across the glimmering blue water of the Rhone. In the foreground, two lovers stroll by the banks of the river. Here his stars glow with a luminescence, shining from the dark, blue and velvety night sky. Dotted along the banks of the Rhone houses also radiate a light that reflects in the water and adds to the mysterious atmosphere of the painting. It does me good to do something difficult. But it in no way changes the fact that I have an immense need for (should I use the word) religion; and then I go out at nightinto the open and paint the stars, and I always dream of such a picture with a group of lively friendly figures. 1. 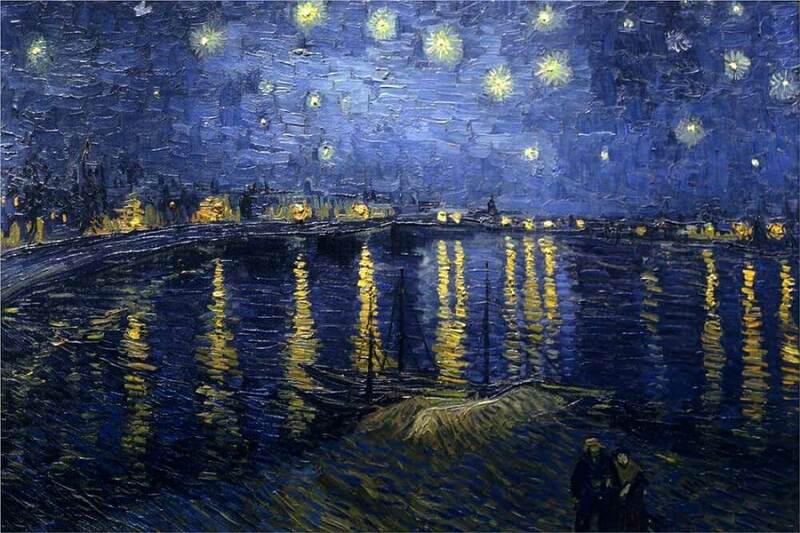 "Starry Night Over the Rhone" was part of the 1889 Society des Independents exhibition in Paris, and was one of only a few Van Gogh artworks shown publicly prior to his death. 2. 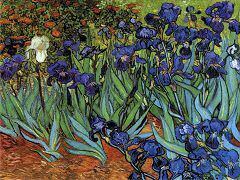 Van Gogh completed the painting in September 1888 while in Arles but before entering the mental asylum at Saint-Remy where he would paint Starry Night. 3. Unlike Starry Night and Café Terrace at Night, "Starry Night Over the Rhone" was inaccurate in its placement of the Big Bear constellation in the heavens. 4. The gas lights and their reflections in the river were a relatively new phenomenon in Arles. Paris itself had only been lit at night since around 1853. 5. 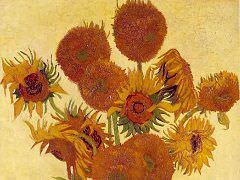 The thick brush strokes and texture in the painting were described by critic Georges Lecomte, a contemporary of Van Gogh, as a "ferocious impasto." 6. "Starry Night Over the Rhone" remained with private owners in the Netherlands until 1922 when the Buffa Gallery of Amsterdam acquired it. 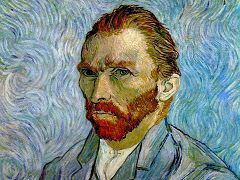 Since 1975, it has resided at the Musee d'Orsay in Paris. 7. The places where Van Gogh set up his easel to do his plein air paintings are now part of the Van Gogh Tour in Arles. 8. 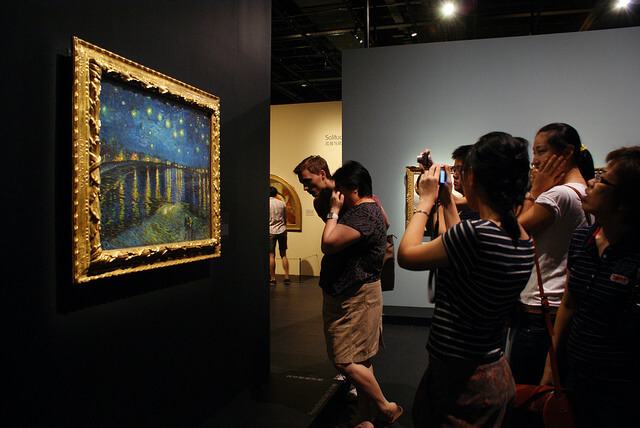 In 2015, Van Gogh's "Starry Night Over the Rhone" was displayed beside contemporary Edvard Munch's "Starry Night". Both feature a night sky and a pair of lovers, but stylistically, they are quite different. 9. Through his use of the complementary colors blue and yellow in "Starry Night Over the Rhone," Van Gogh heightens the brightness of the lights, suggesting their harshness in the natural landscape. 10. 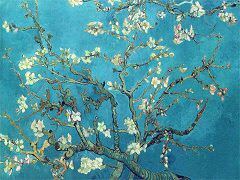 The blue and yellow hues in the painting also complement each other in terms of temperature. By juxtaposing yellow against blue, Van Gogh adeptly conveys how the heat of the lights burns upon the cold water.